1. Save data into multiple places. Your photography website is one of your most important business assets, so you need to protect it. Most importantly, don’t just save backups on the same hosting space as the website itself. For example, many WordPress users save backups on the same hosting space. But if that ever gets hacked, you lose access to both your website and you backups. If you can’t react quickly and restore files from a backup in case of a problem, then the backup is useless. The backups you create contain all important files. When a crisis strikes, you don’t want to discover that your backups were lacking certain files or database exports. At the very least, schedule weekly database backups and monthly full-site backups, but this depends on how often you need to update your site. Don’t just set it and forget it. Make sure you double-check your backups once in a while. If using a plugin of some sort, make sure it sends you email notifications (especially in case the backup process has errors). Save everything you upload to the site: photos, graphics/icons, PDFs etc. Don’t delete those files from your computer and then just rely on your website to be your “archive”. When using such a plugin, take some time to configure it properly. Select multiple backup destinations (if possible) and choose what to include/exclude. WP core (wp-admin & wp-includes folders, some root files). These can always be restored from a fresh WordPress download. Plugins. It’s useful to have a text list of the plugin names, but the actual plugin folders can always be restored again. The database is the one that keeps plugins settings. Backups :-) This is useless, but you’ll be surprised how often it happens. Some backup plugins/services don’t automatically exclude past backup files, so new backups keep growing and growing, and you soon run into hosting problems. Other static files: some people place large files/archives on their site’s hosting space (for sharing with others). Try to exclude those from your website backups (to keep the backup file size low). Backing up your WordPress site is a critical part of a responsible WordPress maintenance routine. Learn all the details of how to manage WP yourself from my WordPress maintenance course for photographers. 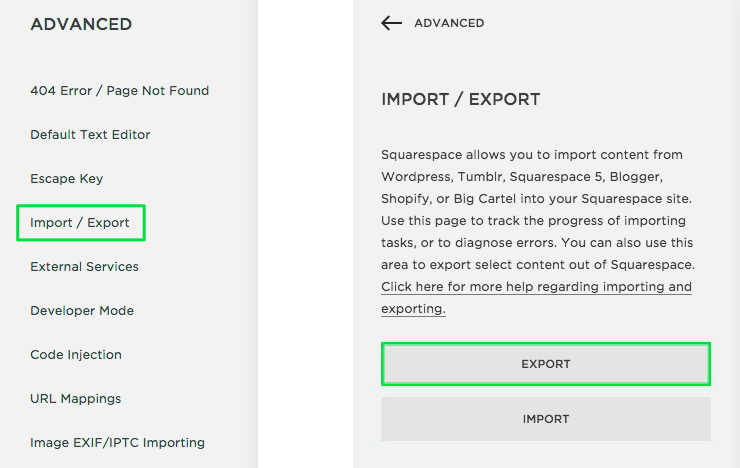 Being a managed platform, Squarespace automatically backs up your content (on multiple servers) so you needn’t worry too much about it. If needed, they do have an export function (which is useful when needing to switch to other platforms). And if you’re just looking to recover deleted pieces of content, here’s how you can restore a post or a page. Research if your hosting platform has a built-in backup functionality. If using cPanel, you’re in luck. If not, simply Google “[hosting provider] backup website”. For example, WP Engine (the WP hosting service I love and recommend) automatically does daily backups of the entire site and has a nifty 1-click restore procedure. With them, I never need to install a backup plugin (nor do I worry about security, they handle all of that and fix the site themselves for free if anything were to ever go wrong). For Drupal, Joomla or other web apps, using a service like BackupMachine works well. For other photography-specific platforms (PhotoShelter, SmugMug etc. ), you likely need to manually copy-paste template source code into text files on your computer. Why text files (and not Google Docs or Word documents)? Because preserving text formatting is critical for source code. And then store those files somewhere safe. This article is about backing up your photo website. Protecting your own computer data (including your photography work) is a whole other ordeal. I personally back up my computer using BackBlaze, for $5/month I have 1.3TB of data backed up safely, with easy restore functionality. Apple’s Time Machine is a great option as well. If you want to dive deeper into the topic, the most comprehensive resource for backing up your photos is this $20 guide from Photography Concentrate (no affiliate link). And finally, this is a great time to remind you to also secure all your admin passwords.